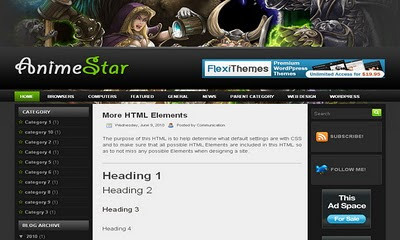 Description : Anime Star Blogger Template is very professional blogger template that is converted from word press theme to blogger with great effort. It has all things you are looking for like Clean Read more posting, navigation bar two on top, Search box, and RSS ,Twitter Widgets,Ad Banner,Social Widgets and more..
Properties : 3 Coulmn, 1 Left sidebar, 1 Right Sidebar, ads Ready, Black, Fixed, Gray, White. tapi bisa ga ya gambar di headernya di hapus ? Header nya bagus, cuma kurang feature readmore nya ya.